The description of the cell life needs not only the knowledge of its genome and proteome, but also of the location of the metal ions and their different complex species in the subcellular compartments, that is of metallome. The cross-talk among these players of the omics’ world secures the cellular homeostasis by means of a complex network, the alteration of which may give rise to many diseases. Copper and zinc ions levels regulate protein expression and metal-responsive transcription factors and in many pathologies metal dyshomeostasis induces to aberrant expression of different factors. microRNAs, a class of a small non-coding RNA molecules, act as RNA silencing and post-transcriptional regulators of gene expression contributing also to metal regulatory activity. 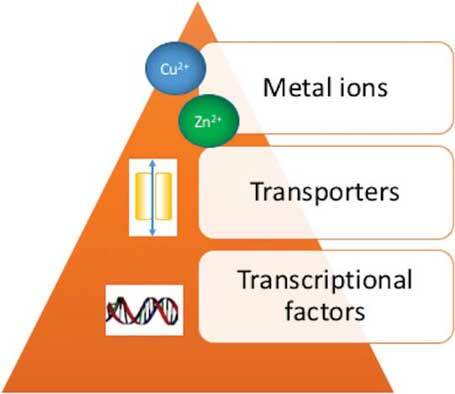 The aim of the present review is to present how metals dyshomeostasis can be cause of diseases, involving different and specific metal chaperones, metal transporters, metalloproteins, small molecules and metal-sensing transcription factors. Two distinct classes of pathologies, cancer and osteoarthritis, are discussed starting from the metallostasis (metal homeostasis) and turning up to miRNAs regulation. The understanding of post-translational regulation, driven by metal ions sensing, may help to identify more specific targets and drugs to pathologies in which metal ions are involved. Copper, Zinc, Metallome, Cancer, Osteoarthritis, Angiogenesis, miRNA, Metal-trafficking. Department of Pharmacy, University of Pisa, Via Bonanno Pisano 6, 56126, Pisa, Italy., Institute of Biostructure and Bioimages, CNR, Via P. Gaifami 18, 95125 Catania, Italy.